It's a good adventure story involving a girl whose mother dies (why does that always seem to happen in these movies??) so she leaves California and goes to Scotland to live on her dad's ranch. There are some funny parts, like when she first tries to mount a horse. But there are also some scary parts that might be hard for younger girls to watch (kidnappers, cruelty to animals, getting lost in the woods in a storm). For me it was full of suspense. Good show worth checking out. 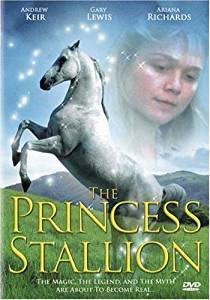 Since the horse is a stallion, why is the movie called the Princess stallion? Shouldn't the title be the Prince Stallion? Hello! I love watching horse movies but I can't find DVDs for such films in Istanbul shops. My best dressage movie is Long Shot starring Julia Benz and I also think Princess Stallion is a great film. This is not the first horse movie I seen, and it is not as good as others(Flicka for example). There's nothing much happened in the film. This film teaches us that we must believe in magic and wonders. We should believe to our imagination and dreams even though they may seem a bit crazy. The Princess Stallion was the first horse movie I ever watched! I loved it! The stallion is soo beautiful and free! This movie was also funny too! I love when the two 'takers' are in the pond, or river, or whatever it was, and the one guy says "You know I never noticed how beautiful this place is". "It's so peaceful". BOOMMMMMMMM!!!!!!!!!!!!! HAHAHAHA! FUNNY!! I also love when there driving and the one guy shouts at the girl!! I can't remember what he says, but it's funny!! I haven't watched it . . . I haven't watched it but sounds soooooooooooo cool, I wanna watch it. I'm not afraid of kidnappers, I write stories myself about animal cruelty and like getting lost stuff. Hope I can persuade mummy daddy to watch!!! This was such a sweet movie and the horse was so beautiful. By the time it ended i was crying beacuse it was so good and I can't wait to see it again. Hey, I haven't seen this movie, but I'll be looking for it! BTW, I agree with you on the fact that "Mom" DIES in several books and movies! Wait a sec.... am I going to cry while I watch this? This is the story about a girl who goes to live with her dad in Scotland. She had grown up hearing and reading the story of the Princess Stallion and had it always in her mind. One day she sees the stallion and adventure begins. I love this movie because it has genuine sounding Scottish accents and the Princess Stallion itself is BEAUTIFUL! The scenery in this movie is breathtaking!